Few could have predicted the bloodshed on the afternoon of January 30 1972. A week before Bloody Sunday, soldiers fired plastic bullets and CS gas at protesters at a banned civil rights demonstration on Magilligan Strand near Londonderry. Four days later, two Royal Ulster Constabulary officers were shot dead by republicans in the nationalist Creggan area of the city. While tensions in Derry were high as the morning of January 30 1972 arrived, few could have predicted the bloodshed that followed. It was just after lunchtime when demonstrators started assembling on the Creggan estate for the latest Northern Ireland Civil Rights Association (Nicra) protest march, an event outlawed by a Stormont ban on large public assemblies and processions. This time the destination was the city's Guildhall. Due to get under way at 2pm, the start is delayed by 50 minutes to accommodate the steady stream of late arrivals. Marchers leave Creggan Drive and set off for the city centre, with hundreds joining in at almost every turn. The march passes the Bogside Inn bar and continues on to William Street. Estimates of the size of demonstration at this point vary. Organisers claimed up to 20,000 people were involved, while the authorities put it at a more conservative 3,000 to 5,000. With the Army having erected barricades blocking the way to the Guildhall, the main body of the march turns left on to Rossville Street towards the revised rallying point at the famous Free Derry corner at the entrance to the nationalist Bogside estate. A number break off and continue down William Street to confront soldiers at a barricade. Some rioting ensues. Minor clashes between stone-throwers and security forces at this junction were commonplace, with locals dubbing the area "aggro corner". Before the main shooting incident and at a location away from both the riot and march, two soldiers in a derelict building on William Street fire a number of rounds after claiming they had come under attack. An Official IRA member is believed to have fired at the building during this incident. Two men are injured when the soldiers opened fire. One of them, 59-year-old John Johnston, dies four months later. Campaigners have long acknowledged him as the 14th victim of Bloody Sunday. 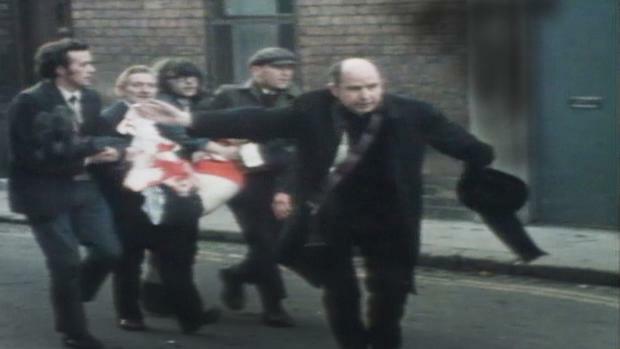 However, the Bloody Sunday inquiry said the wounds he sustained on the day did not contribute to his death, noting he had an inoperable brain tumour. Rioters disperse from William Street after the Army deploys water cannons. Paratroopers request permission to commence an arrest operation on those who had fled down Chamberlain Street and Rossville Street. A company of paratroopers, led by Major Ted Loden, is given an order to start arresting any remaining rioters in William Street. But they are told not to engage in a running battle down Rossville Street. The soldiers open fire on people in the area of Rossville Flats. - Car park of Rossville Flats: Jackie Duddy. - Forecourt on the other side of the flats: Pat Doherty, Barney McGuigan. - Rubble barricade in Rossville Street beside the flats: Hugh Gilmour, Kevin McElhinney, Michael Kelly, John Young, William Nash and Michael McDaid. - Glenfada Park on other side of Rossville Street: James Wray, Gerald Donaghey, Gerald McKinney and William McKinney (not related). As well as the 13 fatalities, 15 other people are wounded. More than 20 soldiers fired in the incident, expending 108 rounds in total. The Army claims it came under fire in the Rossville Flats area, allegedly from the Provisional IRA. Eyewitnesses insist none of the dead were armed.